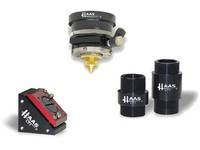 Haas Laser Technologies, Inc. designs and manufactures custom laser beam delivery components for all facets of laser applications at its 35,000 + square foot, company owned facility in Flanders, New Jersey. The company is recognized as an innovator and technology leader, providing one of the largest selections of laser beam delivery components available worldwide. Haas Laser Technologies, Inc. was established by Gilbert Haas in 1992. Mr. Haas founded the corporation with the mission to "Produce laser beam delivery components that define industry standards which conform to highest standards of innovation, reliability, and quality." The development of a proven, modular concept product line was then under way. Today, Haas Laser Technologies, Inc. is vertically integrated with an experienced engineering design staff, advanced manufacturing group, and complete state-of-the-art machine shop. The corporation currently has thousands of its products in continuous operation 24 hours a day, 7 days a week at installations through out the world.